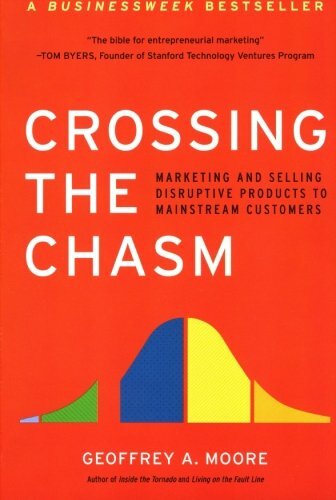 Crossing The Chasm: Marketing and Selling High-Tech Products to Mainstream Customers or simply Crossing the Chasm. This book was recommended to me by someone I interviewed with. I was looking for insight into the market and what they were trying to do. She said it was an old one but a good one. I agree. 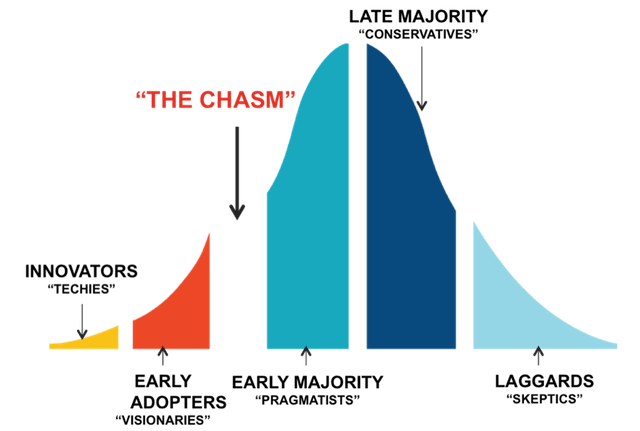 Geoffrey A. Moore explained “crossing the chasm” with five segments which closely relate to the technology adoption lifecycle. Innovators (techies), early adopters (visionaries), early majority (pragmatists), late majority (conservatives) and laggards (skeptics). The key is to focus on one segment at a time and use each one as a base or launch pad to take on the next one. Each segment has a gap to cross but it’s the size and complexity from visionaries to pragmatists that makes it a “chasm”. The pragmatists would be the start of the main stream market and where most startups fail to make progress. Really interesting book and recommend for anyone interested in marketing strategy and disruptive products. I learned a lot and will likely read again at some point. It’s pretty marketing heavy so not for someone looking for a light read.